Perhaps our most unique balsamic yet, this is truly deep ‘dark’ chocolate. The rich aroma alone is heavenly. Do not be fooled, however – while it is fabulous when used with fruit and desserts, a myriad of savory possibilities await the adventurous cook. For dessert possibilities, drizzle on ice cream, strawberries, coconut or fruit sorbets. On the savory side, try using in a vinaigrette and on a green salad for a tantalizing flavor combination your guests will be mystified by. Or think in terms of a Mexican or Spanish ‘mole’ – make a sauce with chili peppers, tomatoes and spices. Use our Dark Chocolate for braising and roasting with a variety of meats & vegetables. 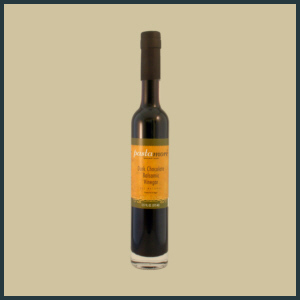 Their Dark Chocolate Balsamic Vinegar is AMAZING! Ice Cream or Frozen Yogurt Worthy!